Teachers, you are visionaries of learning in your classrooms. You work hard to develop lesson plans that will create learning pathways for each of your students, making modifications according to need (i.e. English Language Learners, students with special needs, highly capable students, etc), and ensuring that your students have opportunities to collaborate. You envision that by the end of a strong lesson, or series of lessons (unit), there are positive outcomes for each of your students and the potential for increased progress. By incorporating technology, a strong lesson can become a dynamic one. When that technology is in the form of games, that lesson becomes a dynamic, motivational, and memorable lesson. 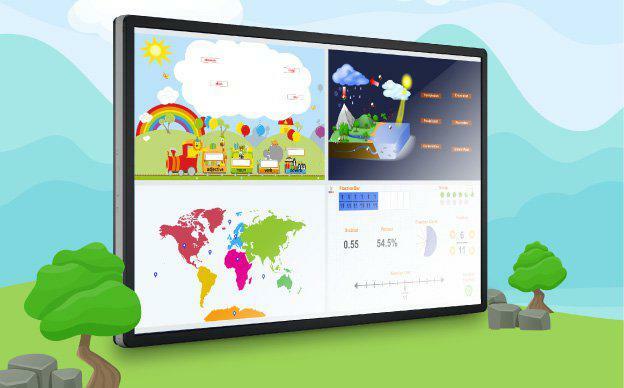 Learn more about how OKTOPUS Game Zones can be incorporated into your traditional lesson plan using your interactive board. Introduce the lesson with a “hook” that will grab hold of the students’ attention. For example, if the lesson focuses on Parts of Speech, play a quick game of “Parts of Speech” where students can sort adjectives and nouns or adverbs and verbs. Students can come to the interactive board as partners and work together, or one student can act as the “sorter” while the class tells where each of the words go. This is the heart of the lesson where explicit teaching of the concept or skill takes place. For example, if the direct instruction focuses on comparing large numbers close this part with a game of “Comparing” where the greater than and less than symbols are dragged to correctly describe the inequalities. Use the “Think Aloud” method to work through a few of the inequalities, then invite students to complete the others, encouraging them to explain their process as they complete each inequality. Students are expected to practice what they learn, with your assistance. In this part of the lesson, direct students to work with a partner or in small groups as you walk around and observe their collaboration and understanding, providing guidance as needed. For example, to help students through understanding government, have teams work together to play “Branches of Government”. Students will place descriptions in the appropriate boxes for the branch of government, its members, and their responsibilities. You can clarify misunderstandings as students work together. This is the time that your students will show how much and how well they have learned a concept or skill. They will complete activities independently, with limited assistance from you. As a motivator and “sponge” for when students complete independent work, they can start a game focusing on the target skill. For instance, after a student has completed a math workbook page on finding the area of shapes, they can play “Area” and work on their own or with a friend to calculate the areas of different rectangles. Conclude the lesson by briefly summarizing the concept or skill learned and ask students what they have gleaned from the instruction and activities. Encourage them to share what helped them learn the skill. Play a game together to reinforce the learning. To wrap up a lesson on the human skeleton, play “Skeletal” where parts of the skeletal system are identified. Once labels are in their correct places, a new blank diagram is loaded for additional practice. Game Zones has a number of games to support Social Studies, Math, Language Arts, and Science concepts and skills. Extension activities can help students build on the objectives of a lesson or series of lessons (unit). With Game Zones, students can work on one game together or split the screen to play up to four games independently. Touch panels can be set to table top mode so teams or individual students can play games you have chosen. This is a great way to extend four different concepts and skills in one area! Yes, games can help children learn! Integrated into a traditional lesson plan, games can help create a positive learning experience. Besides the obvious motivation factor, games focused on specific concepts and skills can reinforce what students have learned and provide a scaffold to the next concept or skill. Games can also keep a class focused, providing you with the opportunity to engage the class in a different way. Reflect when you were a student and games were used in the class. Didn’t you look forward to the weekly spelling bee, Heads-up 7-up on rainy days, or board games for indoor recess? Instead of games for only rainy days or as a “special treat”, incorporate gaming into the instructional landscape of your classroom. Technology can take gaming to another level and Game Zones includes over 90 educational games to engage even the most reticent learner in your class. Try OKTOPUS Game Zones for free in your class, comment on Facebook, Twitter, or Instagram on how you used a Game Zones game, and you might win a $50 Amazon gift card for that comment! *Please see Game Zones (Social Media) Comment Terms for rules. Contest runs between February 5, 2019 to February 7, 2019.